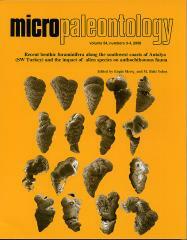 ABSTRACT: The benthic foraminifer Amphisorus hemprichii Ehrenberg is widely distributed in the Indo-Pacific. However, submarine surveys revealed large populations of A. hemprichii along the southwestern coasts of Antalya, Turkey, between Kalkan andKekova. It is also present in the Red Sea which suggests that this species recently experienced Lessepsian migration. It inhabits mostly rocky substrate between 8-18 m water depth, but is also found epiphytically on Posidonia oceanica (LinnÃ©) Delile and Halophila stipulacea (Forsskl) Ascherson. We found rich populations of this species with individuals as large as 1cm in diameter in Ka andKekova. This indicates that environmental conditions are suitable to promote the survival of this species along the southwestern coasts of Turkey.